An entertaining piece-about-a-piece from artist and Stretcher contributor Tucker Nichols, from his current residency in Denmark, is posted here on the Gallery 16 blog. The New York Times reports that yesterday that, in a surprise move, crews with bulldozers tore down the newly-constructed Shanghai studio of internationally-known artist Ai Weiwei. The government has been escalating persecution of Ai following his statements in support of imprisoned Nobel peace prize winner Liu Xiaobo. Ai, who was once regarded as the public figure who proved the Chinese government’s increasing openness to free speech, was reported as saying he must now regard the studio as a performance piece. 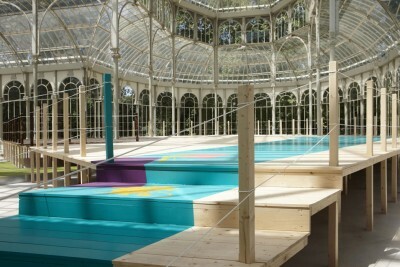 At Madrid’s Cristal Palace located in the Retiro Park, Jessica Stockholder’s “Peer out to See” pleasantly occupies most of the structure in a balanced and engaging way. Riffing on the the location of the Palace next to a small pond, she has constructed a wooden platform (a “pier,” the first of many puns) that extends into the building. This is flanked on one side by a color-coordinated column of plastic household goods (unfortunately not the kind found at Pier One) and on the other by a star-shaped pool of green duckweed and a circle of orange pigment. On material terms, the piece easily shows Stockholder’s long and assured practice: everything contains a confidence of proportion, color, and weight. The piece occupies and alters the space without overwhelming it, and the space of the viewer’s movement within it seems both natural and well-considered. It takes advantage of both the light and lightness of the space to to provide an engaging experiece. As successful as it is, I did have the nagging sensation that the situation of walking the plank more could have had clearer (and possibly deeper) implications than what is found here. But perhaps that doubt is a measure of the work’s success. Maybe Stockholder is gently observing that we are always in danger of falling off the edge of the platform, the beauty of its surroundings is no barrier to the proximity of the dropoff. As I left the building I came across several children tossing pieces of bread to several large fish, turtles, ducks, and a pair of black swans (indeed it appears that the entire ecosystem of the pond now depends on the kindness of small children). It was a reminder that in contrast to all the light and possibilities of lightness in “Peer Out to See,” the implications of two black swans hard by a crystal palace is something that no stockholder would wish to explore.